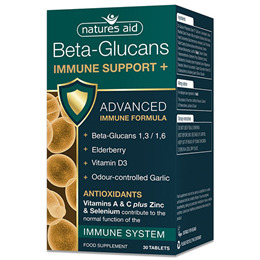 Natures Aid Beta-Glucans Immune Support + Antioxidants is an advanced formula to help support the body`s immune system. The Immune Support + is an advanced immune formula containing beta-glucans 1,3/1,6, elderberry, vitamin D3, odour controlled garlic as well as antioxidants vitamin A & C plus zinc and selenium. Di-Calcium Phosphate, Ester-C (Calcium-L-Ascorbate), Odour Modified Garlic Powder, Microcrystalline Cellulose, Beta-Glucan Yeast Concentrate (Saccharomyces cerevisiae), Zinc Picolinate, Tablet Coating (Sodiumcarboxymethylcellulose, Dextrin, Dextrose Monohydrate, Lecithin [Soya], Sodium Citrate), L-Selenomethionine, Elderberry Prep. (Elderberry Extract, Maltodextrin), Anticaking Agent (Vegetable Source Magnesium Stearate), Vitamin A (as acetate), Copper Gluconate, Vitamin D3 (Cholecalciferol), Anticaking Agent (Silicon Dioxide). Take 1 tablet per day with a cold drink, before food. Below are reviews of Natures Aid Beta-Glucans Immune Support + - 30 Tablets by bodykind customers. If you have tried this product we'd love to hear what you think so please leave a review.